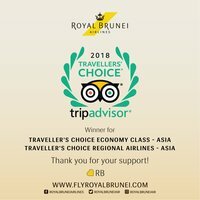 Royal Brunei Airlines (RB) is pleased to announce it has been recognized as a winner in the 2018 TripAdvisor Travellers’ Choice™ awards for Travellers’ Choice Economy Class – Asia and Travellers’ Choice Regional Airlines- Asia. TripAdvisor yesterday announced the winners of its annual Travellers’ Choice awards for airlines. The travel planning and booking site has highlighted the world’s top carriers are determined based on the quantity and quality of reviews and ratings for airlines worldwide gathered over a 12-month period. The reviews rates carriers on factors such as customer service, cleanliness, check-in and boarding, legroom, seat comfort, value for money, in-flight entertainment and food and beverage. “The entire team at RB is extremely proud of this achievement. We would like to thank our guests for their continuous support and recognition of the improvements we have made in our products and services. I also would like to thank our staff for their dedication and hard work on the ground and in air that has allowed us to reach this milestone. We look forward to continuing to surprise and delight our guests and to feature amongst the best in the world” said Karam Chand, Royal Brunei Airlines’ CEO. To read TripAdvisor traveller reviews and opinions of Royal Brunei Airlines, you may visit here. For all of the 2018 Travellers’ Choice award-winning airlines, go to www.tripadvisor.com/TravelersChoice-Airlines. Travelers can also follow the conversation on Twitter at #travelerschoice #travellerschoice.